This is a Thrifty & Delicious Food Gift Idea! Vanilla beans are wonderful items to have in your pantry simply because they are relatively inexpensive when bought in bulk and each of the 175-200 beans in a pound are incredibly potent. For example, you can slice the bean open and use the tiny seeds in your favorite baked treat or ice cream, but don’t discard the leftover shells! 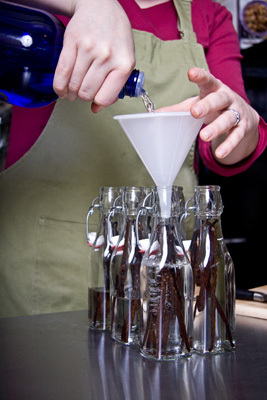 You can use those to make vanilla extract, vanilla vodka, or any other vanilla flavoring you can think of. 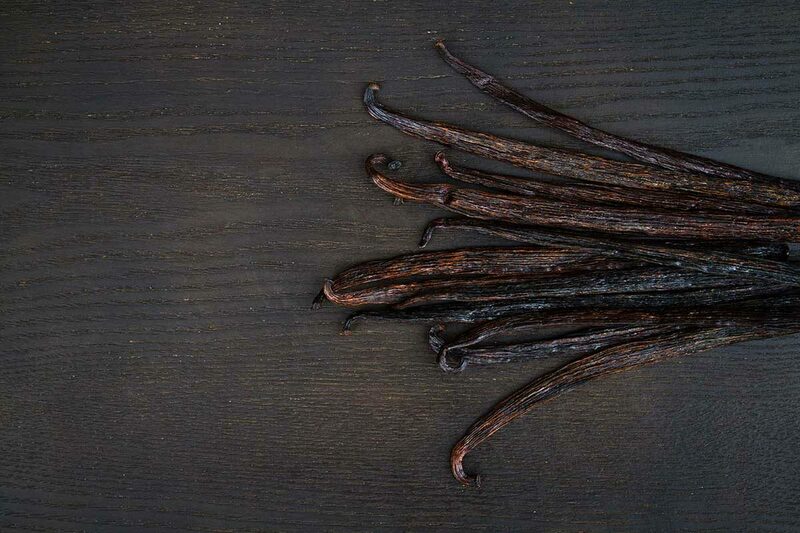 For further proof of the potency of vanilla beans: One bean can be used to flavor two cups of vanilla sugar, and then that same bean can be used to make vanilla flavored vodka, and then used again to flavor your favorite holiday beverage such as mulled wine. Just rinse with each use and start again. Over time a bean will start to lose its vanilla goodness depending on how vigorously it’s been used, but their uses can defiantly be stretched if you just get a little creative. Leave the mixture to sit in the pantry for 4-6 weeks, swirling it around maybe once a week to check its progress. Give it a whiff. After a couple weeks, you should have some very nice vanilla vodka (if that was your alcohol of choice.) But if you let it sit for the full 4-6 weeks you will have a lovely amber liquid (i.e. vanilla extract) ready for baking, or whatever you use extract for. As the vanilla is used, the jar can be replenished with more alcohol. Or if you need a vanilla bean for a recipe, you can pluck an intact one out and use its seeds. Just rinse it off and you’re ready to go! Keep adding more alcohol and beans as they are used, and there will be extract for years. And if you have extra beans, you can make other things with them too, like vanilla sugar. 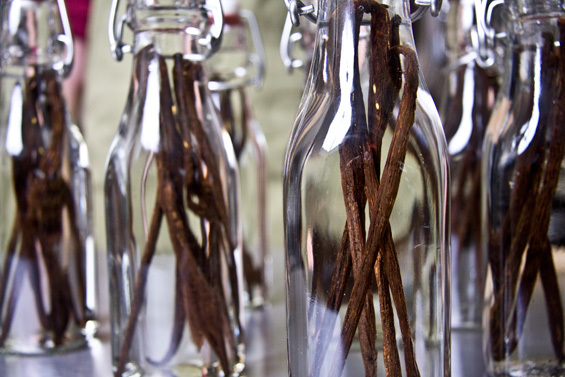 Awesome post and I have been thinking I need to burn through these vanilla beans I have gotten. I really like those jars. Any idea where I could get them at? A. You can also use rum. Wow, great recipe! Thanks so much for sharing this. And these things really keep for years? I think the bourbon is a bad idea, unless you want vanilla bourbon. I don’t think they’d get along. 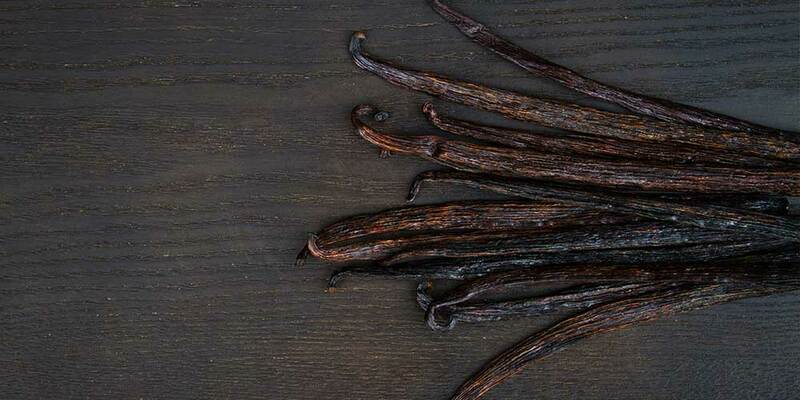 Artificial vanilla (aka vanillan) is made from wood – just like bourbon. So why mix up you vanilla with vanillan (unless you’re a vanilla villian)? Go with vodka or clear rum. Great recipe. I had no idea vanilla extract was part vodka. I’m thinking a very nice gift for any occasion would be a jar of vanilla sugar, a jar of vanilla extract and then a bundle of the beans wrapped in tissue paper. For my sister, I’d need to make some vodka too. Amazing. Lynn A.
I was just on twitter, and someone else is thinking vanilla beans and Christmas. I got so excited, that I went and took a photo of my vanilla extract in the making. I think everyone is going to enjoy getting vanilla beans and vanilla extract from me at Christmas. Lynn A.